Single story home located on the beach, with large back yard and a patio that looks out over the ocean. The living room and dinning are a large open room with spectacular ocean views. The large kitchen is located adjacent to the living room and dinning are with access to the patio. The three bedrooms are located towards the back of the house. This home offers both comfort and beauty with the addition of beach access and a short distance to town. No smoking, no pets, linens & towels not provided. NIGHTLY MINIMUMS VARY SUMMER AND HOLIDAYS. 3 nights on the Beach! Our annual high school cheerleaders reunion long weekend was a delight, at 698 Pacific in Cayucos! The sounds of the surf and ocean breeze can be felt from every room. The proximity to town made it easy to walk to breakfast each morning. Family brought in the new year at our favorite beach house. The views are outstanding and proximity to town and activities make this a go to vacation destination. It is an older house that is in need of minor repairs. Ladies in the rental office are welcoming and helpful. Very clean, comfortable, great location. Beautiful view of pacific fall asleep to sound of waves. Older house but comfortable. Only recommendation is to purchase some nice lounges and patio furniture sine outside is where u spend most of time. Vacation rental folks helpful. saw the whales from the house. We enjoyed our stay. Location was perfect for kids to hang out at the beach. It's going to be memorable because I was proposed to on the beach:) I would stay there again. Management staff made booking easy. The red house on the beach does not disappoint. Well stocked with all necessities including new and sturdy adirondack chairs on the patio. Family had a great time celebrating Independence Day. Close to many activities. Have booked this property for many years and will continue to do so. Relaxing with a beautiful view. 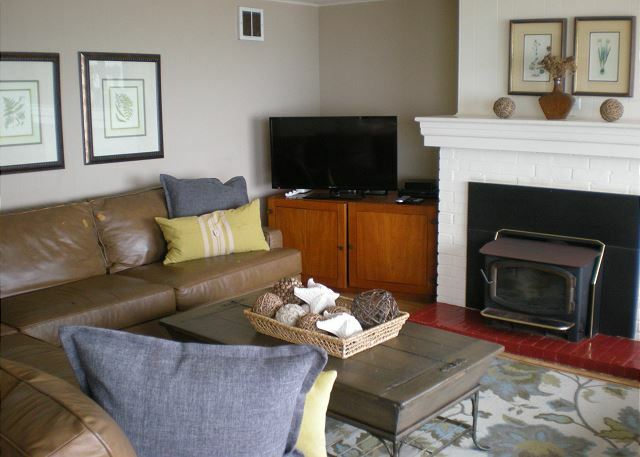 The home is a charming, older beach house & that actually is actually what we love about it. Time-worn but clean, comfortable & relaxing, walking distance to shops & restaurants. We have stayed here several times now & will return. The staff at Coastal Beach Escapes is the best- very friendly & helpful. Love the little red house on the beach! Best location on the beach. Older home so a little worn but fully functional. Downside was dryer didn't work but everything else did. Great WiFi. This was our 2nd time at this property and we can recommend it to anyone that wants a beachfront location that is affordable. 698 Pacific is a comfortable house to stay in. Beach front location provides awesome views as well as close proximity to restaurants, shopping and other activities. House was clean and well stocked with many necessities. Rental office was very accommodating and made booking easy. Would recommend this property. Home was very usable and, though older and in some ways showed it's age,made for a great ocean-front getaway. Had a little issue with the management company with lights not working and bulbs needing replacement but with the ocean waves a few feet from the patio these were minor indeed. We will be back to this location as soon as possible. Have stayed at this property many times before. We appreciated the new barbecue and the picnic table. The new sofas are nice but the round "hippee" chair is somewhat unsafe. Also I recommend that extra slats be added under the mattress of the twin bed. The kitchen is well stocked lots of extra pillows and blankets. Office staff friendly as always. Looking to our next visit. We were very satisfied with this property. We LOVE this vacation rental! We've stayed there twice now & look forward to future vacations there. The charm of this little treasure is only surpassed by the views from the living room & kitchen. It's such a comfortable place with plenty of room. The staff at the rental office were helpful & thorough throughout the process. The View is the Best! Coastal Escapes makes booking your vacation rental very easy and convenient. Also always so friendly. This property is not a luxury home, but so what once you see the beach/ocean view. The house is clean and totally equipped with the essentials. Within walking distance to everything, including the Polar Bear Dip. When in Cayucos, you have to eat at Martin's. MY HUSBAND AND I HAVE BEEN GOING TO CAYUCOS FOR THE LAST 25 YEARS. WE HAVE USED COASTAL ESCAPE FOR OUR RENTALS FOR A VERY LONG TIME AND ALWAYS LOVE THE HOUSE AND THE PEOPLE IN THE OFFICE. - Very dirty air filter. We never turned the heater on, but still, these things are cheap and should be replaced occasionally. - Brown masking tape on the arm of the sofa. At a certain point, you just need to invest in a new couch. - Privacy fence near garbage cans has been removed. I liked the privacy it provided. Not sure why it was removed. Getting past those minor things, it is still a great value if you covet oceanfront living. I would much rather stay here than a few houses off the ocean. Plus you are within walking distance to town. We look forward to coming back next year! Enjoyable week at this quaint house. Great weather, great house, good food what more could we ask for. We had a wonderful week. While the home is older & some of the furniture well-worn, we enjoyed it very much. We found it charming with beautiful views, comfortable furniture & close enough to walk to the market & restaurants. Just the vacation we were looking for! The location affords beautiful views of the ocean and we actually saw whales (the binoculars at the house helped too!). Staff were very friendly when we made the reservation & on check-in. We hope to return next year! absolutely beautiful view, loved our stay have stayed here now twice and plan to make it a annual trip. General condition of house could use a little TLC but otherwise nice. Staff at Costal Escapes very friendly and helpful, would recommend this property to my friends. It had a million dollar view !! Big deck loved the location. It needed a little TLC but would rent it again. My family loves to bring in the new year in Cayucos and in this house. 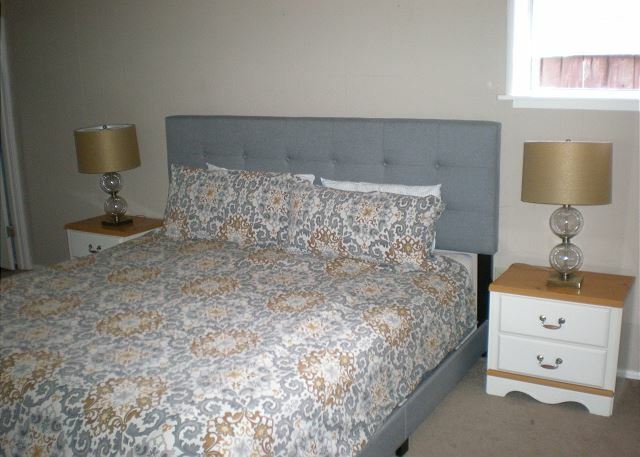 Very comfortable house within walking distance to everything including restaurants, bars, shopping and the Polar Bear Dip. Unfortunately I had to call the office for maintenance issues. The gentleman that answered the phone was kind, helpful and very concerned. A maintenance worker arrived within 30 minutes and resolved the issues. We love the views and the large patio that is perfect for bar b queing. Sugggestion: the dryer needs to be replaced. Was our 8th year renting this location, we love it. This beach front home again did not disappoint. My family has spent many vacations at 698 Pacific and for what it offers we will come back for many years. Great restaurants, bars, coffee houses and wineries are just a few steps from the front door. The house has a big screen TV, free wifi, and a fully stocked kitchen. There are even beach toys for kids if you have any.If its your first time at this house, don't expect an elegant beach house. But it is comfortable. 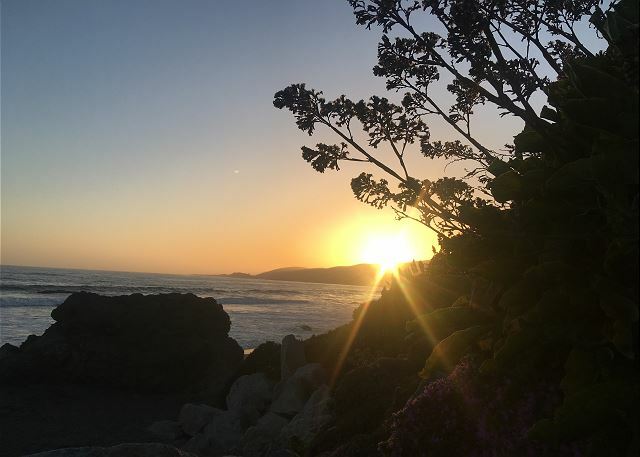 My business prohibits me from traveling very far from Arroyo Grande, so Cayucos has been my families favorite and only destination for the past 14 years. We love Cayucos and so do our childern. It is the perfect place to be as active as you want or just chillax. House could use a little TLC, but other than that, the view, location, and comfort were wonderful. Great place. Much larger then expected. Huge patio and great parking area. Very quiet area and very private. Would rent it again for sure. Bring your linens, towels, soap, toilet paper and paper towels. They get pricey at the general store. Ask and you shall receive. Other reviews stated the house could use some updates. And I loved what was done to this vacation home. The new drapes in the living room made for easy privacy when needed. The big screen TV was a major plus as was the free wifi. Other upgrades was the new washer, some new furniture and the comfortable adirondack chairs on the patio. We thought the chalk board was a nice touch. And of course the biggest asset of this house is the incredible beach view and easy access to the ocean. We will be back for years to come. Vacation was wonderful. We would highly recommend this property. 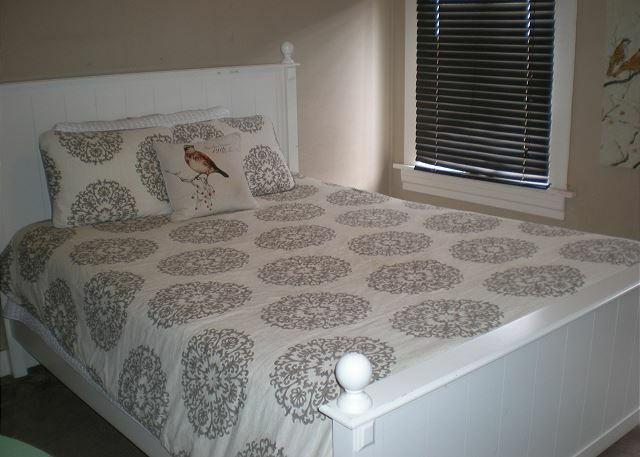 Very comfortable, well furnished, clean, right on the beach and close enough to walk into town. Great weekend with wonderful family and a beautiful home :) view is breathtaking! Will definitely be staying their again! Spent a week at this location and had an outstanding vacation. Celebrated New Year's Eve and then participated in the Polar Dip. The property could use a few updates but nothing that would diminish our experience. Waking up to the beautiful ocean view each morning cannot be beat. The folks in the property office are outstanding and make us feel like old friends each time we book with them. Will return for many years to come. Give Coastal Escapes a try. We have stayed at 698 Pacific for the last three years. We love this house for several reasons - the large front fence makes a great play area for our kids who are too young to be trusted on the street, the house is nice but not so nice that I have to worry too much about the kids breaking things or making a mess, and the location is so close to downtown that we can all ride our bikes down. However, the house is in need of some deep cleaning and maintenance. My biggest negative is that the window coverings in the living room don't stay up; we were lucky enough to have some bungee cords with us that I used to hold up the blinds during the day. Also some of the cupboard doors in the kitchen don't stay closed - very annoying. All in all this is still a good house but it needs some work. 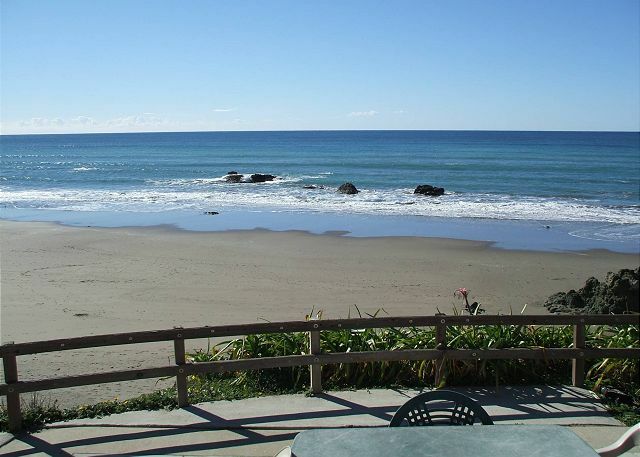 Perfect location, close to town, great beach site. Fantastic views from the living room. Negatives: washing machine not in great condition, no dishwasher, kitchen not well equipped, not enough blankets. My family and I spent another July 4th week at this property again. Our vacation was amazing beginning with the courteous management staff. The large patio made barbecuing a treat with the grand ocean views. You also can't beat that the parade starts in front of this house. We were also very close to many wineries and can walk to all sights in Cayucos. Thank you Coastal Escapes for a great time! No matter what time of the season this place was excellent.A few minor updates wont hurt like new chair high toliets for the 86 yr old that enjoy the most beautiful ocean view. Its very very comfortable and cozy home loved it.Just a few upgrades to make it better for the senior citizens.The dryer door handle was broken needs to be fixed. Thank You very very much. Spent a few days at this property after New Year's Eve and to relax from work. Really loved the ocean views and the weather cooperated. Was able to see the pier to the right and Morro Rock to the left. The proximity to the great wineries is a plus. Also liked that we could walk or bike to restaurants, shops, bars, and tennis. Thanks to Coastal Escapes for a great coastal escape. I loved the charm of this older home. It was a bit dated but very clean. The kitchen had the basics covered for a weekend of cooking plus three charcoal bbqs. 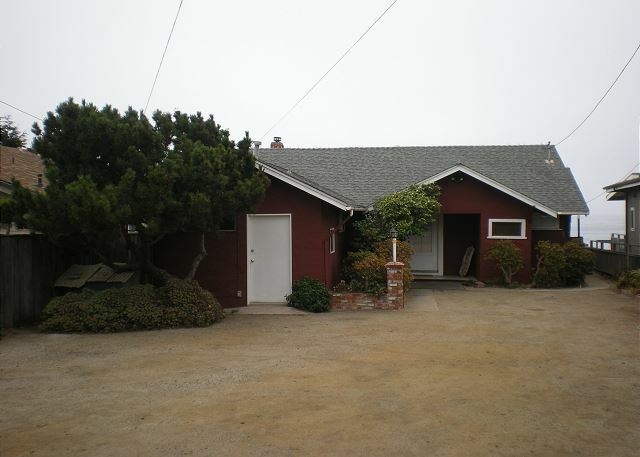 The location was perfect as it was right on the beach and very close to the town of Cayucos. We sat on the big cement patio and watched all kinds of sea life go by. 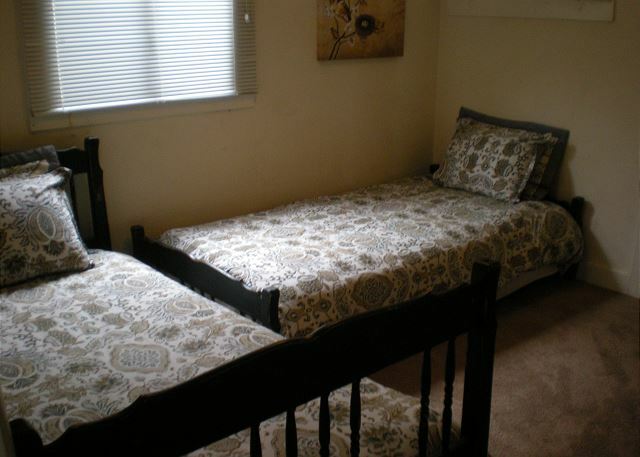 Three nice sized bedrooms provided plenty of space to spread out. Cozy and clean...we loved it!! wE LOVE THE HOUSE AND LOCATION. wE HAD SEVERAL ITEMS THAT NEEDED TO BE REPLACED/UPGRADED THE QUEEN BEDS, THERE WAS A LEAK IN THE WASHING MACHINE, RUGS VERY SOILED, UPHOLSTERY ON KITCHEN CHAIRS SOILED. wE HAD A WONDERFUL TIME, WEEK JUST WENT BY TOO FAST. My family and I spent the 4th of July holiday at this property. The house was comfortable and offered fantastic views of the coast. The beach was just a few steps away and convenient to watch the kids play in the sand from the huge patio. The house is equipped with a well stocked kitchen and a Weber bar b que. The office staff is efficient and very friendly. I arrived early for check in and the house was not quite ready. I received a call as soon as it was ready. Very much appreciated. We had a wonderful time in Cayucos, thanks in large part to the amazing home we stayed in. The views from the living room were breathtaking. We'll definitely be back... and hopefully soon! The house and the location was is a older home but it has everything you need for a great week or weekend! My friend and my birth dates are 3 days apart and we decided to celebrate at this Cayucos home. It was a great weekend and an awesome place to stay. Management is always so friendly! Great time was had at "Cayucus". Just ended another great vacation in Cayucos. I've rented this house several times and have not been disappointed. The views are the best!! Will back in 2012 and 2013. Loved being right on the water. the beach was quiet and safe for kids. i would definitely come again! We rent a beach house at Cayucos almost every year. This is the first year we rented this house, and we were very happy with the house. The location on Pacific avenue was great; fabulous ocean views from the living room and kitchen. The photos on the website DO NOT do justice to the fabulous views of the house. The house is comfortable. We didnt use all of the bedrooms, so I cannot speak to past complaints of the uncomfortable bed. The location of this house on Pacific Avenue is ideal - walking distance into town, and just far away enough for privacy and quiet. This house has a large patio, and it has a small fence around patio which provides some security for small children, being on a bluff. My only complaint was the sliding glass door, which is the only exit from the house onto the beach. The door is hard to open and harder to close. It actually hurt our arms closing the sliding glass door. The Property Mgmt Staff (Theresa) are very nice, as always. Hope we are going back next year. We were unaware there was a problem with the sliding glass door, we will get it fixed right away. Thank you. The house was awesome. Great little fenced in parking area in front of the house was perfect. View was awesome! Everything else was as to be expected. After all, it's a beach house! Plenty comfy beds, kitchen was fine. Stairs down to the beach were a bit scary, but we managed. I would definitely stay here again!! I feel 698 Pacific has become my home away from home, since I've rented it so many times. I am already booked for June 2010 and for the 4th of July in 2012. The upgrades were a pleasant surprise. Waking up to the view of the ocean is absolutely beautiful. Friends that stayed with me were also awestruck and glad they were invited. Great place to vacation !!! Will keep coming back. Fun in the Sun !!!! We love this property and will be staying there again. Great location nice amenities (except one ot the queen beds is in a room that slopes a bit so we put the kids in there and we took the twin beds . Overall we really enjoyed the location of the house and the beautiful ocean views. I would suggest a queen or king size bed instead of a double in the one room. None of the couples could sleep comfortably in that small bed. It is ok for a single person. The house should be advertised as only sleeping 5 people not 6. We loved being able to access the deck from the kitchen (at the back of the house). We have stayed in this property twice now and love it's location to the beach and also downtown Cayucos. It is perfect for families with young children. 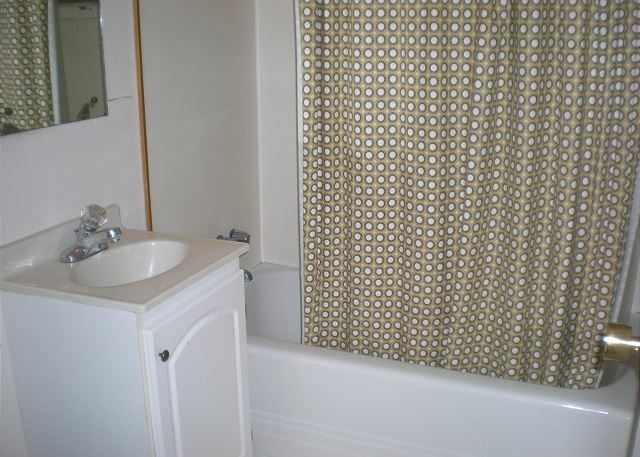 The bathrooms are basic: but that is absolutely fine as we were not looking for luxury. 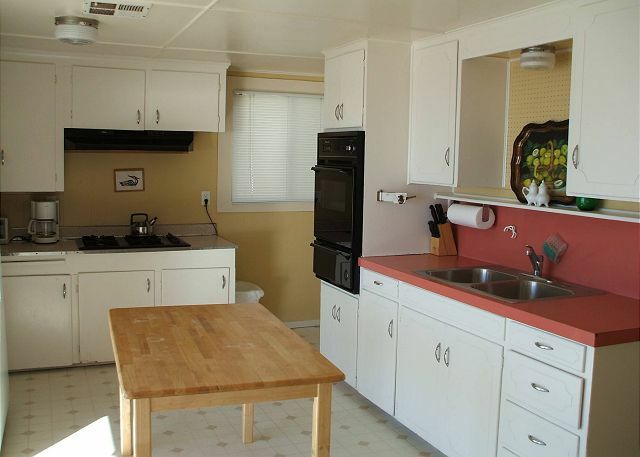 The kitchen is well equipped, and the living room and bedrooms are fine. This house was sooo relaxing!! Very cute house!! We can't wait to come and stay again!! The location is perfect!!! We chose Cayucos for our annual gathering, and loved the accommodations. Strumming the guitar at Riddell's Smokehouse (GREAT tuna tacos), watching the elephant seals north of San Simeon, Boogie Boarding, listening to the band at the Tavern (it NEVER disappoints), and just hanging out was great fun for this group of friends on our annual weekend together. Usually we're in the snow of the Sierras, but the detour to the beach was a welcome change. Thanks for everything. This is the second time I have stayed at this property and have already booked for 2011. Reasonably priced for an ocean front property with outstanding views. The house is quaint with ample parking. What a wonderful place to unwind for a long weekend. What an absolutely spectacular view. It made our stay! We definately hope to be back next year. 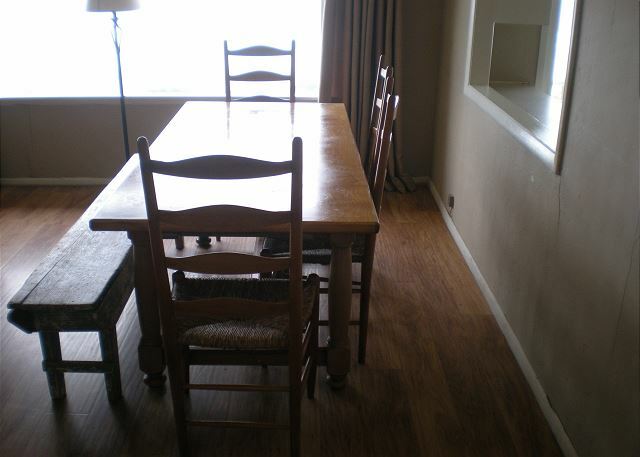 A wooden chair in one bedroom needed to have the leg repaired, was broken. The big windows in the living room were very dirty, we cleaned them ourselves. Sliding glass door in kitchen could use a screen. 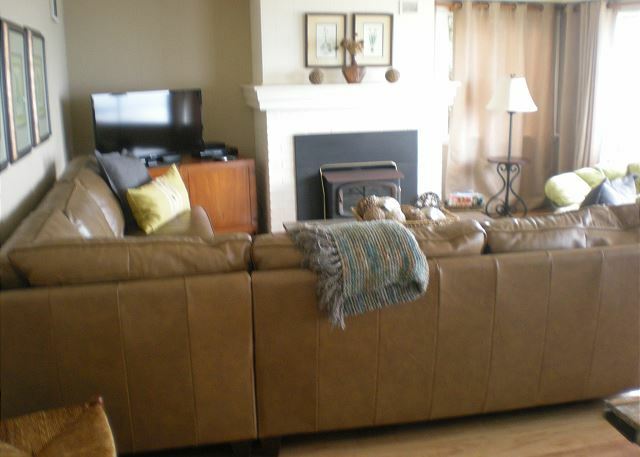 We absolutely love Cayucous and the vacation homes that your company provides are wonderful! We would like to especially thank Rhonda and Theresa for all their help in ALWAYS making our stays in Cayucous just so incredible!!! Thank you so much and we'll see you in September !!! January 2009 -A wonderful stay here with great beachfront patio (could benefit greatly by addition of umbrella for shade).The view is just what you wish for. The furniture was super comfy (a deal breaker for me) A little bit of this and a little bit of that would be the design theme. The beds were just ok as far as comfort.Nothing fancy in the bedrooms. If you like to cook I'm afraid it is lacking for quality cookware. Bring your own? I always bring must haves.Great Place overall. Hard to complain with the fantastic views from inside and out. Thanks to owners for opportunity and privilege to stay in their home. P.S.= Always respect your neighbors privacy! Cayucos is a great town that we have loved to visit for many years. One negative was the lock on the front door. We were unable to lock it from the inside, had to run around to the front door, lock it, then run around to the back door to get in. Same procedure had to be done in the morning to get out the front door. This is certainly not "up to code", and if there was a fire no one could get out of that door. A screem door on the sliding glass door in kitchen would help to keep out the bugs. We loved the house, it was very cozy, especially with the fire place. The location is great and we can't wait to come back. Our two year old son kept calling it "home". The only flaws: the microwave did not work and there were no lids for the pots in the kitchen. There was a lot of dust under the windows in the bedrooms. Everything about the place was great. Only issue was the front windows were dirty on the outside and we had to make do and clean it ourselves to enjoy the view. 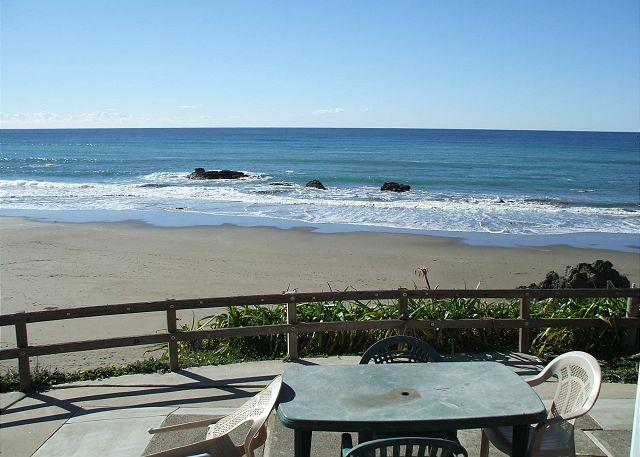 We have used Coastal Escapes many times over the years for our stays in Cayucos and have never had any problems. They are professional, extremly nice and always helpful. We loved the location and the back patio was awesome. This was our first rental on that was oceanfront and I will prob ably never rent non-ocenaside again. The location of this house is GREAT!! We walked just a few blocks into town or to the park. The house is older but had a great back patio and stairs to the sand. When we first arrived there were ants in the kitchen. Once we sprayed and cleaned them up they never came back. Kind of annoying but not a big deal. The staff at Coastal Escapes are kind and helpful. Cayucos is an amazing place everyone should visit. Small "ocean village" with amazing beach and great people-love it!! 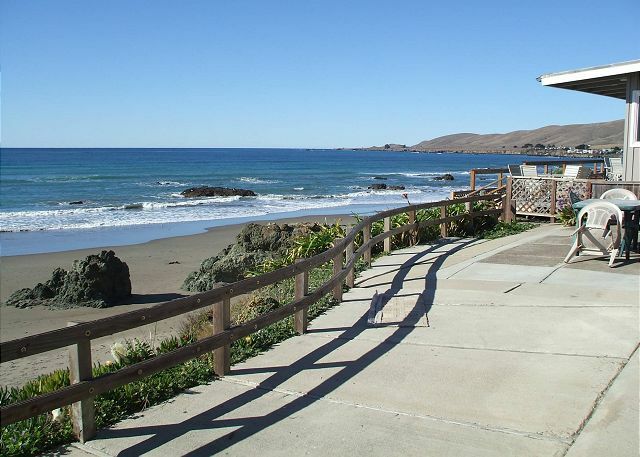 The view from 698 Pacific is my favorite on the beach at Cayucos. Huge oceanfront windows frame the waves and wildlife of the Pacific. The simple flagstone patio is a great spot to read a book, enjoy a BBQ and marvel at millions of stars in a black sky. If you're looking for luxury, look elsewhere as the home itself is simple. But if your goal is to enjoy a stay on a cliff over the ocean - 698 Pacific is your best pick!